Despite the overwhelming evidence against them, many people still believe they can overcome the economic and racial constraints placed upon them at birth. In the first edition, Heather Beth Johnson explored this belief in the American Dream with over 200 in-depth interviews with black and white families, highlighting the ever-increasing racial wealth gap and the actual inequality in opportunities. This second edition has been updated to make it fully relevant to today’s reader, with new data and illustrative examples, including twenty new interviews. Johnson asks not just what parents are thinking about inequality and the American Dream, but to what extent children believe in the American Dream and how they explain, justify, and understand the stratification of American society. This book is an ideal addition to courses on race and inequality. In The American Dream and the Power of Wealth, Heather Beth Johnson convincingly illustrates how beliefs in meritocracy and the American Dream not only serve to obscure educational inequality but more significantly serve to reproduce racial wealth inequality. In this Second Edition, Johnson shows how this meritocratic ideology is past down from one generation to another. Accessible to undergraduates, this book provides the perfect mix of original research, theoretical analysis, and implications for public policy. Disrupt your students’ passive acceptance of meritocratic explanations for social inequality with Johnson’s compelling critique of the American Dream! This accessible read explores the paradoxical beliefs of sympathetic American families and kids who universally profess an ethos of hard work whilst simultaneously enjoying privilege or, alternatively, enduring disadvantage. 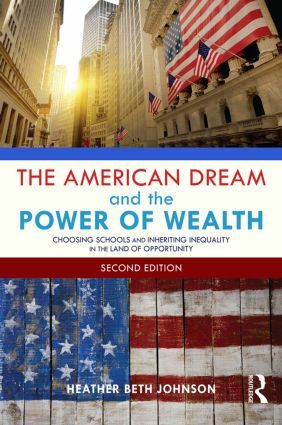 The American Dream and the Power of Wealth has become the classic analysis of the often distorted and contradictory understandings of Americans about the role of wealth in reproducing race and class inequality in the United States. In this second edition, Heather Beth Johnson adds the voices of children to demonstrate how this distorted view of the "American Dream" has been passed along to the next generation. This book was already an outstanding teaching tool—it just got better! In this new edition, interviews with well-off children reveal many similarities with their parents’ views of inequality: a commitment to hard work and equal opportunity, coupled with stereotyped and racially tinged views of "the poor" and only vague awareness of the importance of inherited advantages. Johnson provides a nuanced and theoretical informed analysis of Americans’ deeply contradictory and often paradoxical interpretations of the increasing inequality of wealth and educational opportunity in the U.S. Her analysis also shows why changes in the social structures that reinforce inequality of wealth (such as local financing of public schools) will be so difficult to implement.